Do you live in the Inland Empire, LA or Orange County and have your been looking how to keep cool under your patio or backyard area? We provide Patio Shade Sails in residential and business establishments across southern California. We provide complete protection from the sun. We are in Patio Shade Sails business for years and our unblemished record in patio shade installation in the City of Chino, CA has received various commendations from our clients. We have been recommended in the installation of pathways in San Bernardino, CA and patio shades in resorts in Fontana, CA. We are the leading patio shade sails installers in the area of Rancho Cucamonga, CA and have been complimented in the city of Chino, CA. Our unblemished records of patio shade cover installations comes in different designs and color that will suit our clients need. Our patio covers are made of highly polyethylene materials and other high end materials as you preferred them. Our patio shade covers also come in various sizes and dimensions that will accommodate the sizes of your patios and pathways. We are also number one in the City of Covina, CA in patio shade cover requirements of business establishments. We have been the front runner of the business because we have experience and expertise in patio shade sails cover installations. Why choose Cali Shade Sails in providing shades in your patios and pathways? Because Cali Shade Sails has always been number one in the business for years. We have served and provided patio shade covers in the City of Riverside, CA, Corona City and surrounding communities. Our records have been untarnished for years because our expertise and experience in the field of providing patio shade sails cover is perfect and has satisfied our customers for the last decade in business. Today, Cali Shade Sails is also available to provide patio shadings in the City of Corona and Fontana, CA. Our high end patio shade sails cover has received various accolade by our previous clients because we made our patio shade sail covers perfect and safe for the protection of your families. Our Cali Patio Shade Sails is number one in the City of Pomona, CA. We have been in the city and have provided the needed patio shading requirements of hospitals and business establishments of the city. 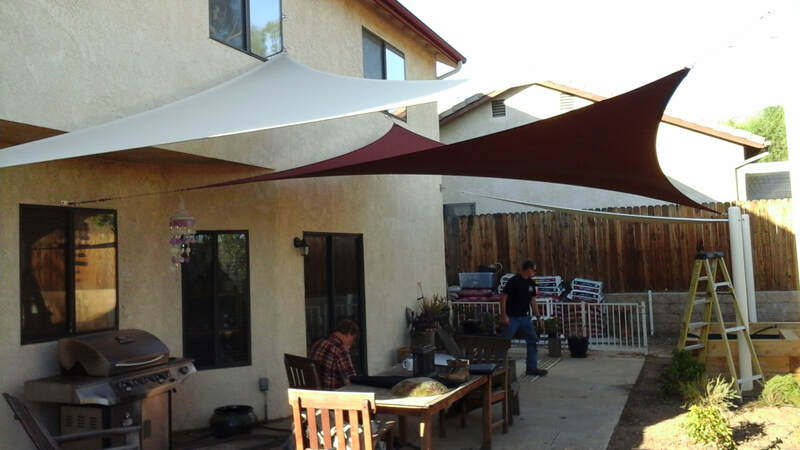 Our vast experience in patio shade sails technology has brought us to be number one in the City of Rancho Cucamonga, CA. We have provided patio shade covers of patios of Hispanic Villas of the city. We are also the front runner in patio shading technology in the surrounding areas of the city and has received various accolades and admiration from business clients and government for being able to provide patio covering in the city playgrounds making sure that our children are walking in pathways safely. Our unblemished records in patio shading technology has received complimentary citations in the City of San Bernardino, CA, having provided patio shade covers in government offices and pathways. Our number one concern is for the people of our cities to be protected from the soaring heat of the sun mostly during our long summer vacation where our children and family meant to enjoy. We are providing patio shade sail cover in Ontario, CA for almost a decade and was able to provide protection to our residents who called us requesting to provide them patio shade covers of their patios. We are always called to provide because we are the only high end, number one providers of the most safe, the most durable, and the most perfect patio shade covers in the country today. If your patios are left uncovered for years, you can call us now and our technicians will right away come to you and do physical inspection of your patios that need to be covered. We are happy to serve you, discuss with you and we are willing to receive your suggestions as to how your patio shade coverings looked like. Our integrity and reliability is guaranteed and we will deliver to you on time and promise you that we only install high end patio shade covers with high quality standards.